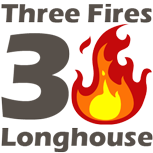 The Three Fires Longhouse is dedicated to enhancing the relationship between children and their fathers. The program offers many and varied opportunities to firmly set aside that “quality time” with our children which otherwise might be lost in our frenzied Dad-Worlds. Members of the Three Fires Longhouse program participate in small groups called Tribes. A Tribe usually consists of 7 to 10 parent/child pairs, which take turns meeting in each others’ homes regularly throughout the school year (September through May) for Tribe activities. Tribes are traditionally organized into all boy or all girl groups. These Tribes combine to form the Three Fires Longhouse. Longhouse gatherings and events may vary from year to year. An annual calendar is posted in the fall and maintained throughout the season, which allows plenty of planning time for Tribe and Longhouse leaders. The core of the Three Fires Longhouse program is these Tribe and Longhouse meetings and adventures. Typical activities during the year include camping, biking, games, canoeing, skating, community service activities, bowling, a Pine car derby, “fun nights” and much more! For more information about the program, contact us! We’d love to hear from you.